THIS WEEK’S OTHER FEATURED BOOKS, “DANCING AT THE GOLD MONKEY,” BY ALLEN LEARST AND “BREAKDOWN,” BY DEBORAH TELLER SCOTT, CAN BE FOUND BY SCROLLING DOWN BELOW THIS POST, OR BY CLICKING THE AUTHOR’S NAME ON OUR AUTHOR PAGE. THE EDITOR: Mark Eddy Smith (a fabulous developmental editor). THE PUBLISHER: WordFarm, small INDY press specializing in literary fiction, creative non-fiction and poetry WordFarm.net. SUMMARY: The year is 1976. The scene composed of clapboard marinas, bays, mangroves, stilt houses, sea grapes, and barrier islands reachable only by boat at the edge of the Florida Gulf. This has been Lily Harp’s world since before her mother’s suicide seven years ago. In Grandpa’s truck, rescued from art school, Lily’s journey begins. “I felt my belly swell my skirt and I thought about what was inside; the nurse at school said it had fingernails.” In the shadow of her mother, seventeen-year-old Lily’s choice unfolds. “I didn’t think I could give it away, but I didn’t know if I could keep it either.” This book reads like theater, with the poetic language of literature, and a cast of unforgettable characters. (video trailer at www.stacy barton.com). The short stories that follow, offer tragic and tender views of other confused minds and hearts. Many thanks to the journals in which they first appeared: Gargoyle, Best of Potomac Review, Real South, Relief Journal, Ruminate and others. THE BACK STORY: See “Author Comments” below. WHY THIS TITLE? : It was all about Lily. WHY WOULD SOMEONE WANT TO READ IT? If you’ve every wondered about real florida life; if you are a part of a family who struggles and embraces the good, bad and ugly of its generations; if you love to step into someone’s emotional world; if you want to watch a young woman emerge from a struggle, independent and connected; if you like authentic people and real feelings; and if you like a little quirky, a little tragic, your senses perked…try this one….plus there are stand alone short stories in the end! “From the sweltering Florida mangroves to the dust storms of Oklahoma, Stacy Barton sculpts imagery and molds characters who traverse the complex terrain of the human heart.” — Beth Hoffman, New York Times bestselling author of Looking for Me. “Stacy Barton knows her characters like she knows Florida’s Gulf coast, which is to say deeply. Lily Harp is a masterpiece of atmosphere and mood, of jasmine blooms and mangrove roots. — ”David James Poissant, author of The Heaven of Animals (Florida Book Award Silver Medal). “In the luscious novella at the center of this scrumptious new book, the pregnant, seventeen-year-old, eponymous Lily Harp struggles to be, as muddled as the Florida weather.”—Alan-Michael Parker, award-winning author of The Committee on Town Happiness. “Barton has created a sacred space and populated it with unforgettable characters whose stories and struggles are at once evocative and eternal. We will ever keep them in our hearts.” — Cathleen Falsani, journalist and author of Sin Boldly: A Field Guide for Grace. AUTHOR PROFILE:Maybe it was the construction paper or the modeling clay. Maybe it was the picture books her mother read to her as a toddler, or the A. A. Milne her father read aloud once she started school. Maybe it was the dance classes or the macrame or the health food. Of course it could have been that her grandmother was a painter, her great-uncle a Juilliard pianist, her mother a dancer, and her father an unconventional minister. It could have been her brothers’ antics over kick-the-can, or their Hobbit drawings or guitar songs, or the dozen or so dogs they had, or the absurd number of places she lived growing up. Maybe it was the ADD that they didn’t have a name for in those days, or the manic depression that followed, or the struggle to find her own spirituality. Whatever it was, Stacy was bound to end up as some kind of artist. She was performing professionally by the time she was nineteen and directing, writing and creating interactive theater by twenty-four. Her first published words appeared when she was twenty-five, but it wasn’t until her thirties that she took writing seriously. After four kids, the theater turned out to be rough on family life, and so she began to keep the poems she scratched on the envelope backs that floated around on the floor of her minivan. She was thirty-five when a Mack truck totaled her Caravan, forcing her to give up theater and dance because of migraines and herniated discs. She turned to writing and promptly won a small pack of awards for her poetry and scripts and within a few years landed a job as a free-lance scriptwriter for the Disney Company. Since then she has published an award-winning novella, two collections of short stories, dozens of poems, a few plays, children’s books, and animated short films. Stacy lives with her husband, Todd—and whichever of their four kids happen to be in town—in Maitland, Florida, where they’ve made their home for over twenty years. When the house is quiet, she writes for Disney, or works on her new book or plays with construction paper for old time’s sake. Fictional Florida: Lily Harp & Stories. I was an actress in experimental, improvisational theater before I became a writer. Story begins with voices in my head. Later, fully formed characters “step into their light” and offer me their first lines from the stage. 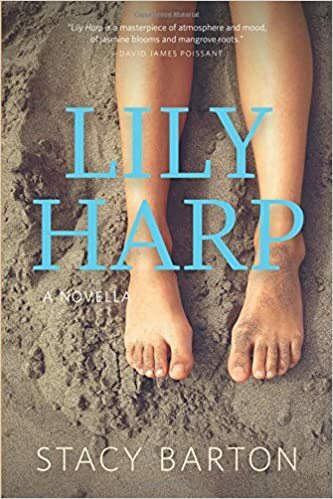 But for my most recent book, Lily Harp it was not character, but place, that first captured my heart and my attention: a barrier island off the southwest coast of Florida called Little Gasparilla. A mile long and a few blocks at its widest, you can only get to this finger of land by boat. On the bay side, the houses peek above the mangroves on wooden stilts—on the other, they perch in the sand of the Gulf. Since the 1980s my husband and I have traveled from Orlando to Little Gasparilla Island, often in our red suburban, loading our tiny flats boat with coolers and black garbage bags of groceries and toiletries. As the years passed we added four kids and a dog. Until a fire consumed it a few years ago, we almost always stayed in the same stilt house. One of our trips came not long after my first collection of short stories was contracted for publication by WordFarm. With Surviving Nashville “in the can” we took the kids down to the island for a week. I was between projects and flailing a bit, uncertain about what I wanted to write next. A few days into the trip, with kids running off to the beach or out on the boat with their dad or along the wood walk to poke and coax the crabs, I realized I wanted to set a story in this place; it was warm and filled with life and happy memories. And so I started taking notes—but true to my self-taught form I was not planning a story, I was listening to the soliloquy of the first character who had stepped into her light…Little Gasparilla Island. It wasn’t difficult; the maternal mangroves that rose in a trio of roots on the inland side of the island surrounded our long dock and stilt house in magic and held secrets of beauty and pain. From that porch of chicken wire and screen I wrote pages and pages by hand of the way the light looked on the mangrove branches, of the smell of her estuary mud and the spirit of the trees. I sat out on the dock wrapped in sun and wrote about the water, the silvery ripples and the grey undercurrent that held them up. I walked in the sandy mud puddles through the scruffy pines to the seaweed beach that sloped into a gentle green. There I wrote about the sunset and the sounds, the moods and the clouds, the shells and the way my feet looked, wavering but clear, through the pale Gulf. When I got home, back to writing theme park shows and carpooling kids and checking homework, I read back over my scribbles while cooking supper and began to long for who might join me in this place of beauty and tears. Who’s story would I tell? Two voices began to emerge—a young girl who lost her mother to suicide and a pregnant teenager uncertain what to do with the child she carried. In the end, they both turned out to be Lily Harp, the main character of my novella. The young woman who stepped into the light to tell me her story—a story infused with her baby, her mother and her island—Little Gasparilla. SAMPLE CHAPTER: You can read the first five chapters via a PDF link on the home page of my publishers website: WordFarm.net. LOCAL OUTLETS: BookMarkItOrlando.com buy from them online if you can – support INDY presses, authors and booksellers whenever possible! WHERE ELSE TO BUY IT: Amazon, Barnes & Noble, WordFarm.net. CONTACT THE AUTHOR: E: words@stacybarton.com; FB: Stacy Barton, Author; IG: @bartonstacy; T: @stacybarton — I truly truly LOVE to interact with readers and ALWAYS respond to their inquiries (WAY faster than I got your assignment complete!!!) I am available for Skyped-in book clubs or email Q&A for book clubs – only charge is to buy/read my book, and if you like it encourage someone else to buy and read one!